Please feel free to share your feedback on Chipmunk2D Physics, and to let us know what games you've made using the engine. We love to hear from our users! We are also available for custom contract development work. For a list of our past clients and references, please contact us. Chipmunk2D Physics - help specifically with physics setup in your game, by the authors of the engine itself! We've done vehicles and their suspension systems, ragdolls, character controllers for platformers, machines with gears, camshafts, and pulleys, robotic walkers, and more. We developed the physics scenes within Alice in New York for Atomic Antelope. Our work has included non-game apps, like the 2010 European Music Awards app for the iPhone and iPad. 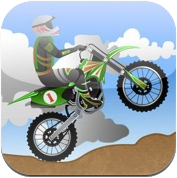 We developed the bike physics and ragdoll for the new version of Mobile App Center's Dirt Bike Xtreme.